hopefully something rhetorical » Blog Archive » An update on those chairs! « it’s just a trash can, but…. An update on those chairs! Last year, I posted about my kitchen chairs. I had a dilemma. 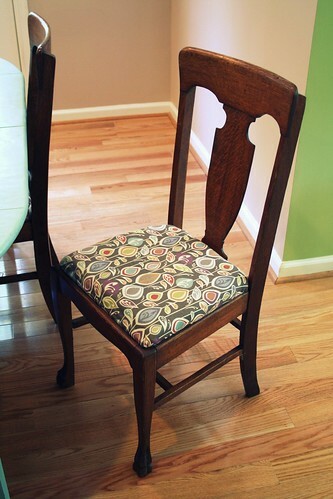 I found these great kitchen chairs at a flea market, but they needed a little love. I was trying to decide on a fabric to use to recover the seats, and I did, so I thought that I would share! As you can see, I went ahead and went with the Daisy Janie fabric, and I love it! These have been done for quite a while, and they have held up really nicely. We decided not to paint the chairs because after we cleaned them up, they looked so good. But, we did paint the table. I really love the way it all turned out!